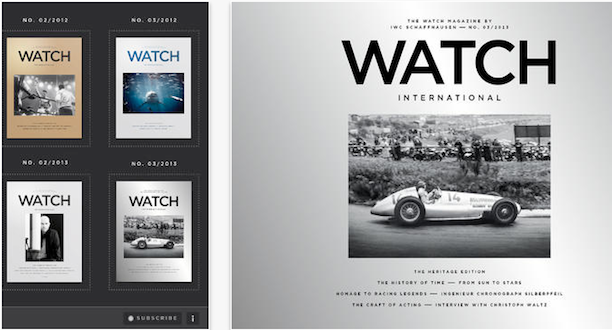 My favorite watch brand IWC Schaffhausen has just released version 1.1 of their incredible iPad app and it’s now available for free for your news stand. I’m not sure if this will be available for any other platforms so you Android users just might have to sit tight. If that comes as a shock it really should…why you ask? Well as we’ve covered before, the affluent users seem to flock to Apple products more than any other so it makes sense for IWC to stick with the iPad. If you’d like to grab yourself the latest copy which is ripe and ready for that Retina display, you can do so right here https://itunes.apple.com/en/app/iwc-watch-international/id519568803?mt=8.